Santo Stefano degli Ungheresi (also San Stefanino and Santo Stefano degli Unni) was the church of the Hungarians in Rome. Located next to the Vatican, the old church was pulled down in 1776, to make room for an extension of St. Peter's Basilica. The church of Santo Stefano was established by Charlemagne in the 9th century. It was a basilical building with three naves. The eight granite columns supporting the roof were Roman spolia. The church was granted to King Stephen I in 1000 by Pope Sylvester II. 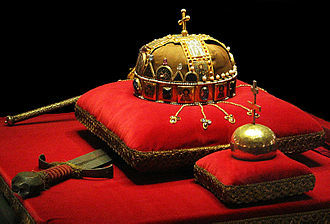 The first Christian king of the Magyars received his crown from the Pope that year. Stephen restored and enlarged the old building. He established a chapter house for twelve canons and a pilgrim's hostel for Hungarian travelers (predecessor of present-day Casa di Santo Stefano). 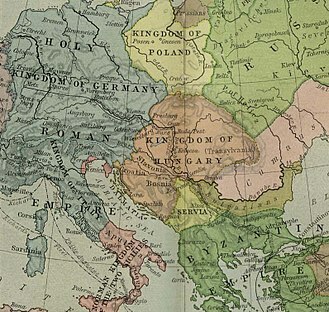 The "Hungarian institutions", as they were called, played an important part in maintaining intensive diplomatic relations between medieval Hungary and the Holy See. They were also a place of learning for Hungarian clerics and intellectuals living in Rome. Around the chapter house and the pilgrim's hostel, there were farm buildings like granaries, store-yards, and mills. The whole complex was surrounded by a wall. 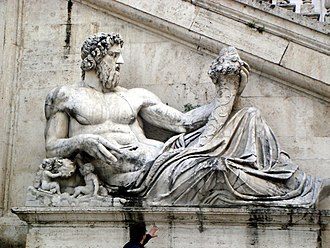 The "Hungarian institutions" were sustained by the income of large estates in the vicinity of Rome. These estates, granted to Stephen I by the Pope, remained in the possession of the Kingdom of Hungary for hundreds of years. The last one in Celsano was only lost after World War II. 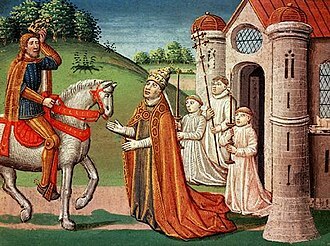 King Stephen I was canonized in 1083, and the church was dedicated to him under the name "Santo Stefano dei Ungheresi". It was restored by Sigismund of Luxemburg, King of Hungary, in the 15th century. Later, it was entrusted to the Pauline Fathers, the only monastical order founded by Hungarians. 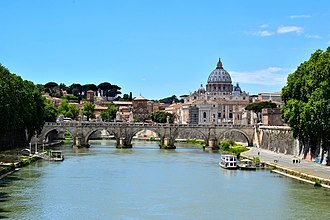 In the 16th century, the nearby St. Peter's Basilica was rebuilt in Renaissance style and it was greatly enlarged. The Hungarian chapter house and the farm-buildings were pulled down to make way for the new basilica. In 1776, Pope Pius VI built a new sacristy for St. Peter's and expropriated the old church of Santo Stefano. The Pope gave 7500 scudi for the Collegium Germanicum et Hungaricum as compensation for the loss. Hungarians lost their national church in Rome, but unofficially Santo Stefano Rotondo on Caelian Hill took over this role, where Pius VI built a new chapel for St Stephen. Seven of the original Roman columns of the church were preserved in the new sacristy of St. Peter's. 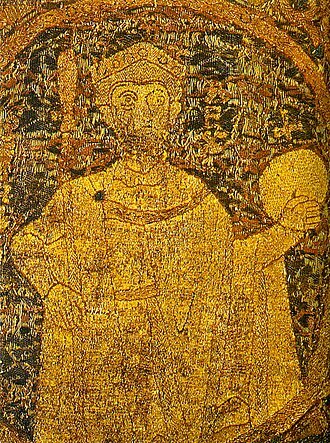 Stephen I, known as King Saint Stephen, was the last Grand Prince of the Hungarians between 997 and 1000 or 1001, and the first King of Hungary from 1000 or 1001 until his death in 1038. 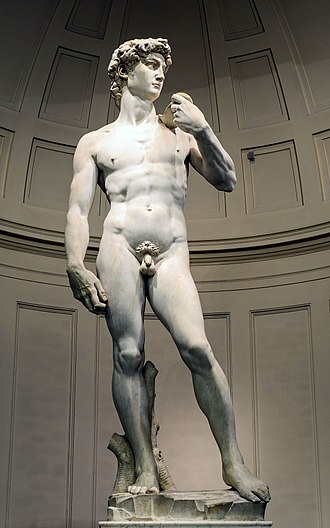 The year of his birth is uncertain, but many details of his life suggest that he was born in or after 975 in Esztergom, at his birth, he was given the pagan name Vajk. The date of his baptism is unknown and he was the only son of Grand Prince Géza and his wife, who was descended from the prominent family of the gyulas. Although both of his parents were baptized, Stephen was the first member of his family to become a devout Christian and he married Gisela of Bavaria, a scion of the imperial Ottonian dynasty. After succeeding his father in 997, Stephen had to fight for the throne against his relative, Koppány and he defeated Koppány mainly with the assistance of foreign knights, including Vecelin, Hont and Pázmány, but with help from native lords. 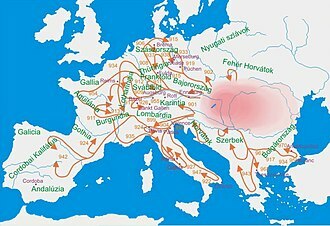 He was crowned on 25 December 1000 or 1 January 1001 with a crown sent by Pope Sylvester II, in a series of wars against semi-independent tribes and chieftains—including the Black Hungarians and his uncle, Gyula the Younger—he unified the Carpathian Basin. He protected the independence of his kingdom by forcing the troops of Conrad II, Holy Roman Emperor. Stephen established at least one archbishopric, six bishoprics and three Benedictine monasteries, thus the Church in Hungary developed independently of the archbishops of the Holy Roman Empire and he encouraged the spread of Christianity with severe punishments for ignoring Christian customs. His system of administration was based on counties organized around fortresses. Hungary, which enjoyed a period of peace during his reign, became a preferred route for pilgrims. He survived all of his children and he died on 15 August 1038 and was buried in his new basilica, built in Székesfehérvár and dedicated to the Holy Virgin. His death caused civil wars which lasted for decades and he was canonized by Pope Gregory VII, together with his son and Bishop Gerard of Csanád, in 1083. Stephen is a saint in Hungary and the neighboring territories. In Hungary, his feast day is a holiday commemorating the foundation of the state. The Church of Saint Anne in the Vatican, known as SantAnna de Parafrenieri, is a Roman Catholic parish church in Vatican City, dedicated to Saint Anne. 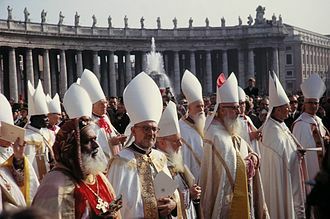 By motu proprio of 20 November 1565, Pope Pius IV authorized the Archconfraternity of the Pontifical Grooms to build a church, close to the Apostolic Palace, the construction began that same year. With a design attributed to Renaissance architect Giacomo Barozzi da Vignola, after a smooth start, the building of the church slowed down due to the financial difficulties of the Archconfraternity. After Vignolas death in 1573, the church was finished by his son Giacinto Barozzi, the church was consecrated in 1583 with a temporary roof. The facade attributed to Borromini and attached to the oval church prefigured the facade of the church of SantAgnese in Agone, the facade was completed between 1700 and 1721 by Alessandro Specchi while the dome was finally built in 1763 and completed in 1775. In 1603 the Archconfraternity commissioned Caravaggio to paint a picture of Saint Anne for the altar of the papal Grooms in the Basilica of Saint Peter. Painted in 1605–1606, the painting Madonna and Child with St. Anne was briefly exhibited in the church of Saint Anne in the Vatican and it was subsequently sold to Cardinal Scipione Borghese, and now hangs in his palazzo, presently the museum of the Galleria Borghese. 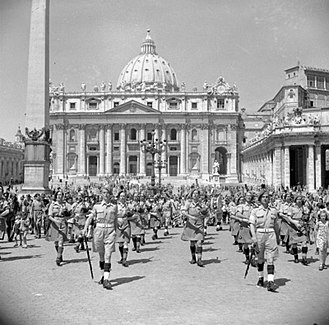 The church belonged to the Archconfraternity until the Lateran Treaties of 1929, Pope Pius XI erected the church into a parish, with the Apostolic Constitution Ex Lateranensi pacto of 30 May 1929. The pastoral care of the new parish was entrusted to the Augustinian Order, in return, Pope Pius XI granted the Archconfraternity the church of Santa Caterina della Rota as new headquarters. The interior, built to Vignolas design, is elliptical with eight side chapels, the main entrance is located at one end of the major axis of the ellipse. The minor axis ends with two chapels, four doors surmounted by a pediment and framed by travertine columns with Corinthian capitals are distributed between the main altar and the side chapels. Four large arches rise at the ends of the two axes, framing the areas of entry, the altar and the two chapels. 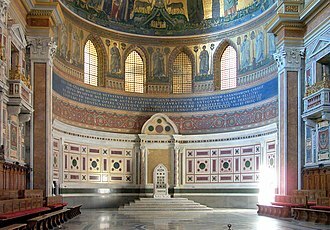 The sacred area of the altar is a square enclosed by four arches as a clear counterpoint to the oval part of the church. The dome itself rests on a plinth with a cornice with three strips, pierced at the base by eight windows, at the top of the dome stands the lantern, the only source of natural light onto the main altar. It is decorated with the dove of the Holy Spirit, from which golden rays radiate in circle, until the mid-18th century, the inner walls of the church were white and the columns showed the natural color of the travertine stone, typical of Renaissance churches. Influenced by the rise of the Baroque in Rome, the Archconfraternity started redecorating the church with more lavish decorations and plenty of gilt, the façade was re-decorated in the Baroque style by Alessandro Specchi who added the upper facade to Vignolas church. The dome was designed by Francesco Navole and they commissioned in 1746 the sculptor Giovan Battista de Rossi to redecorate the church with angels holding garlands in stucco above the doors. The Church of San Pellegrino in Vaticano is an ancient Roman Catholic oratory in the Vatican City, located on the Via dei Pellegrini. The church is dedicated to Saint Peregrine of Auxerre, a Roman priest appointed by Pope Sixtus II who had suffered martyrdom in Gaul in the third century and it is one of the oldest churches in the Vatican City. Under the name of San Pellegrino degli Svizzeri, it became the church in Rome of Switzerland. The oratory fell into disrepair but was restored in the 19th century when evidence of the 9th-century frescoes were discovered. The church now serves as the chapel of the Pontifical Gendarmerie, the origins of the church are ancient, dating back to the eighth century. This is attested to by several passages in the Liber Pontificalis, another reason may have been the churchs service to pilgrims, since annexed to the church were the Hospitale Francorum, a hospital for French pilgrims, and a cemetery. The church was originally called San Pellegrino in Naumachia, a naumachia, literally naval combat, is an artificial lake where naval battles were reenacted for an audience. The ruins of a structure were excavated in 1743, between via Alberico et via Cola di Rienzo. Hülsen suggested that this structure, built close to the Circus of Nero, and gave it the name of Naumachia Vaticana. Subsequent excavations have helped to identify its shape and orientation and it was a rectangular structure with round internal and external corners,120 metres wide and, estimating from the excavations, at least 300 metres long, oriented north-south. Esther Boise van Deman identified the style of the brickwork facing the naumachia as trajanic, in 1932 Jérôme Carcopino reported the discovery among Fasti Ostiensi of the dedication by Emperor Trajan on 11 November 109 of a naumachia. The Naumachia Traiani has been identified the Naumachia Vaticana, Pope Paschal I granted the church to the monastery of Santa Cecilia in Trastevere, and Pope Leo IX passed it on to the monastery of Santo Stefano degli Abissini. From the thirteenth century onwards, the church belonged to the canons of St. Peters and they lost the use of their little chapel in the Church of Santa Maria della Pietà in Camposanto dei Teutonici. Pope Sylvester II or Silvester II was Pope from 2 April 999 to his death in 1003. Originally known as Gerbert of Aurillac, he was a prolific scholar and he is said to be the first to introduce in Europe the decimal numeral system using Arabic numerals. He was the first French Pope, Gerbert was born about 946 in the town of Belliac, near the present-day commune of Saint-Simon, France. Around 963, he entered the monastery of St. Gerald of Aurillac, in the following years, Gerbert studied under the direction of Atto, Bishop of Vic, some 60 km north of Barcelona, and probably at the nearby Monastery of Santa Maria de Ripoll. Neither place was under Islamic rule at the time, Borrell II of Barcelona was facing major defeat from the Andalusian powers so he sent a delegation to Córdoba to request a truce. Bishop Atto was part of the delegation met with Al-Hakam II of Cordoba. Atto was mesmerized by the palaces in Cordoba and returned with great respect for the Arabs, Gerbert insisted that Atto teach him more about these Arabic princes who seemed to him more interested in the sciences and literature than warfare. This sparked Gerberts veneration for the Arabs and his passion for mathematics, in 969, Count Borrell II made a pilgrimage to Rome, taking Gerbert with him. 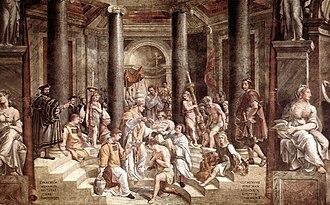 There Gerbert met Pope John XIII and the Emperor Otto I, the Pope persuaded Otto I to employ Gerbert as a tutor for his young son, the future Emperor Otto II. Some years later, Otto I gave Gerbert leave to study at the school of Rheims where he was soon appointed a teacher by Archbishop Adalberon. After the death of Otto II in 983, Gerbert became involved in the politics of his time, in 985, with the support of his archbishop, he opposed Lothair of Frances attempt to take the Lorraine from Emperor Otto III by supporting Hugh Capet. Capet became King of France, ending the Carolingian line of Kings in 987, Adalberon died on 23 January 989. Gerbert was a candidate for his succession, but Hugh Capet appointed Arnulf. 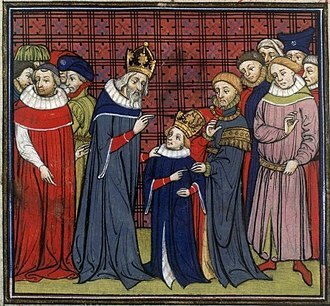 Arnulf was deposed in 991 for alleged treason against the King, there was so much opposition to Gerberts elevation to the See of Rheims, that Pope John XV sent a legate to France who temporarily suspended Gerbert from his episcopal office. The Collegium Germanicum et Hungaricum or simply Collegium Germanicum is a German-speaking seminary for Roman Catholic priests in Rome, founded in 1552. Since 1580 its full name has been Pontificium Collegium Germanicum et Hungaricum de Urbe, the Collegium Germanicum was established on 31 August 1552 by Pope Julius III with the bull Dum sollicita. Cardinal Giovanni Morone and Saint Ignatius Loyola were instrumental in its establishment, the direction of the college was given to the Jesuits. After the Almo Collegio Capranica, this is the oldest college in Rome, the initiative towards its foundation was taken by Cardinal Giovanni Morone and Ignatius Loyola. Pope Julius III approved of the idea and promised his aid, the first students were received in November 1552. He drew up the first rules for the college, which served as models for similar institutions, during the pontificate of Pope Paul IV the financial conditions became such that the students had to be distributed among the various colleges of the Society in Italy. In a short time 200 boarding students, all belonging to the flower of European nobility, were received and this state of affairs lasted till 1573. Under Pope Pius V, who had placed 20 of his nephews in the college, Pope Gregory XIII, may be considered the real founder of the college. The new rector P. Lauretano, drew up another set of regulations, the college had already changed its location five times. In 1574 Pope Gregory XIII assigned it the Palazzi di S. Apollinare, too much attention indeed was given to music under P. Lauretano, so that regulations had to be made at various times to prevent the academic work of the students from suffering. As a special mark of his favour, Gregory XIII ordered that year on the Feast of All Saints a student of the college should deliver a panegyric in presence of the pope. The students generally numbered about 100, however, there were but 54, during the seventeenth century several changes occurred, in particular the new form of oath exacted from all the students of foreign colleges. 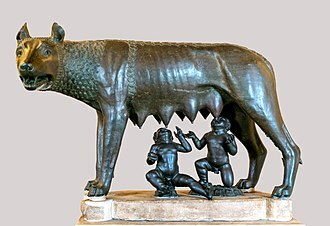 Not to be confused with the older and larger Circus Maximus. The Circus of Nero or Circus of Caligula was a circus in ancient Rome, the accompanying plan shows an early interpretation of the relative locations of the circus and the medieval and current Basilicas of St. Peter. The plan suggests the dimensions of the relative to the Basilicas. 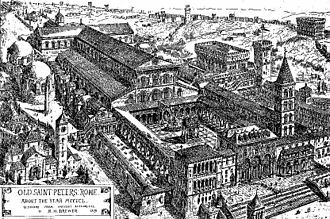 The more modern interpretation shows the circus as being much longer, see plan, Outline of St. Peters, Old St. Peters, and Circus of Nero. In both interpretations the circus building is centred on the obelisk, is aligned on a similar east-west line to that of the Basilicas, the major differences are in the relocation of the starting gates to the eastern end, and the change in proportions of the circus itself. It was begun by Caligula on the property of his mother Agrippina on the Ager Vaticanus, the Via Cornelia ran parallel with the north side of the Circus, and its course can be traced with precision, for pagan tombs have been discovered at various times along its edges. There was a medallion in the centre, with a figure in high relief, the door opened on the Via Cornelia, which was on the same level. This tomb is located under the step in front of the middle door of the church. I am told that the now used as a fountain, in the court of the Swiss Guards, was discovered at the time of Gregory XIII in the same place. 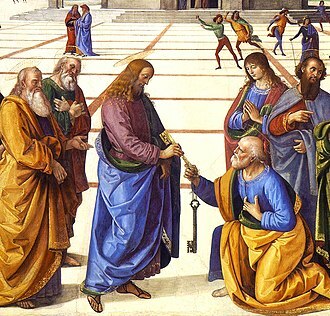 The circus was the site of the first organized, state-sponsored martyrdoms of Christians in 65, tradition holds that two years later, Saint Peter and many other Christians shared their fate. 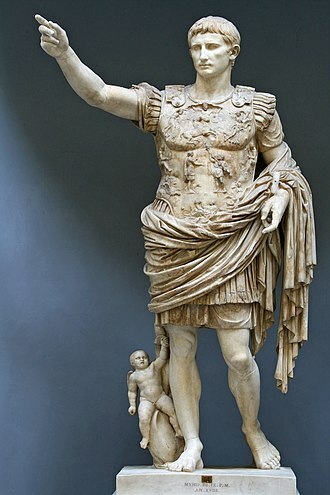 The circumstances were described in detail by Tacitus in a passage of the Annals. The site for crucifixions in the Circus would have been along the spina and this identification is likely to be genuine given the trauma of the event for the Christian community. The obelisk at the centre of this circuss spina always remained standing, the obelisk was originally brought to Rome by Caligula. The traditional location of Saint Peters tomb is in area, in the cemetery mentioned above. Santo Stefano Rotondo in a painting by Ettore Roesler Franz in the 19th century. Santo Stefano Rotondo is the oldest example of a centrally planned church in Rome. Santo Stefano Rotondo in a late 19th-century print. Father Pius Przeździecki, O.S.P.P.E. - Superior General of the Order (1931-1942). The Pauline novices of the novitiate of 2014-15, with the Novice Master and his Socius, after being clothed in the habit of the Order. Ignatius Loyola, co-founder of the college. Giovanni Morone, co-founder of the college. Fragments of Greek inscriptions in the masonry of the Ottoman Heptapyrgion (Yedikule) fortress (1431), Thessaloniki.